Can we talk… about zucchini and carrots for a minute? Before I started my blog if you would have asked me to combine zucchini and carrots to make bread, I would have thought you were making a joke. When I made my first loaf of bread with this combination I thought I was really stepping out of the box. I guess you could say that I was a little naive or maybe even more than just a little. Funny, I just thought the two were not a compatible couple. 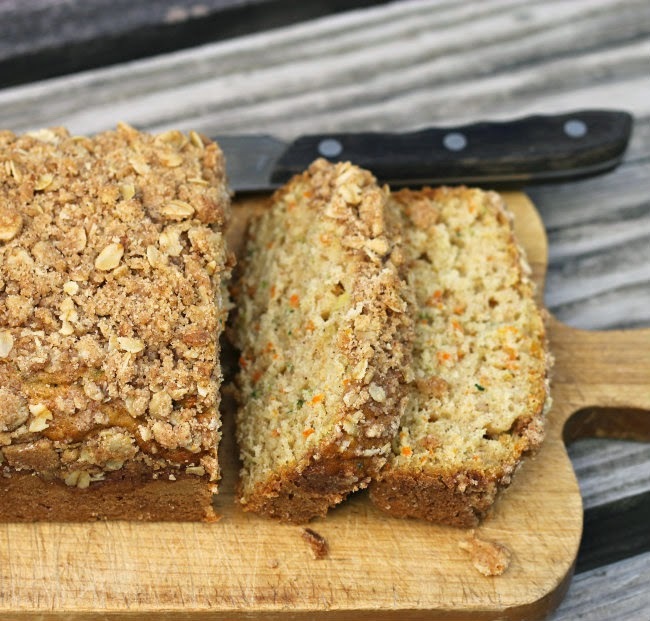 These days I love quick breads with the zucchini and carrot combination. 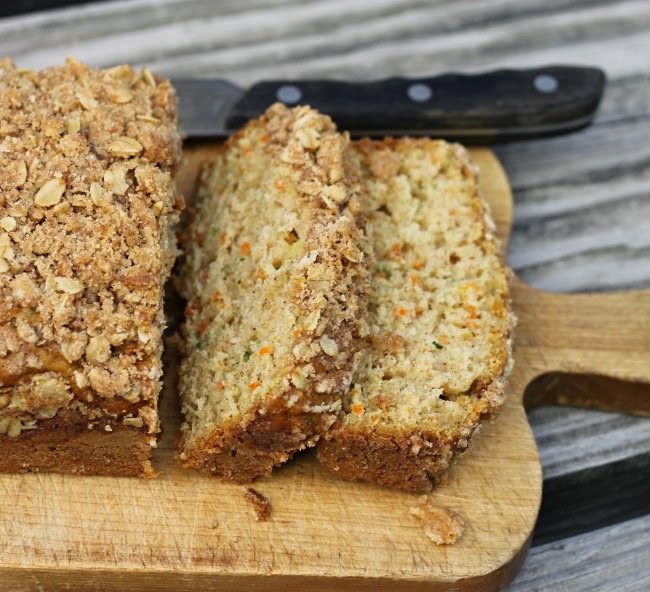 As always bread with zucchini is super moist and for carrots… they give a little extra flavor. I love it. 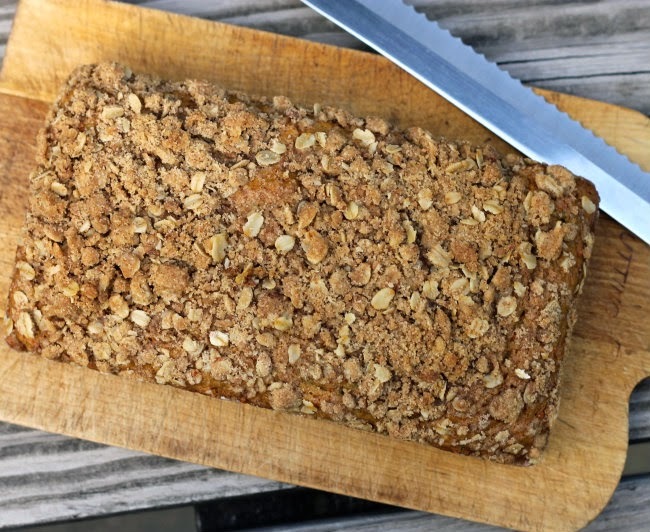 I added a little crumble topping which really completes the bread, with a little sweetness and a nice little crunch. 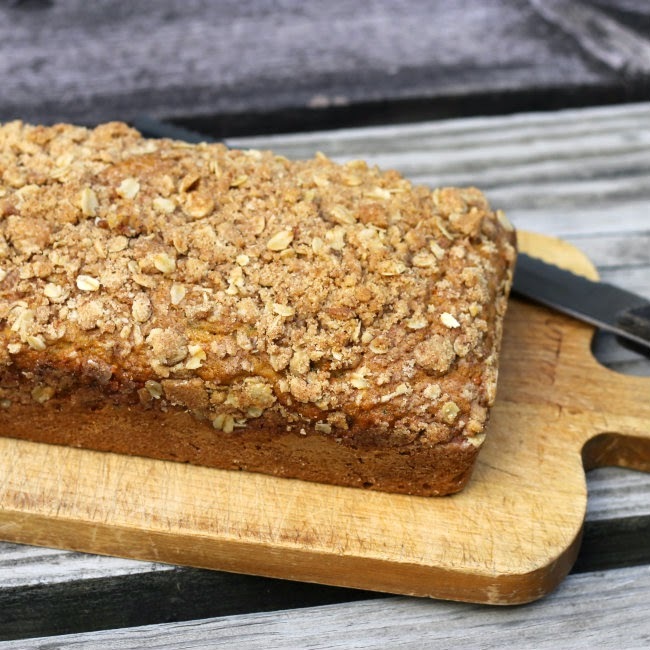 Who knows where I will go next with zucchini bread… you never know what other fruits and vegetables will be in the next zucchini breads. 1. Preheat oven to 325 F degrees. Lightly grease 2 loaf pans. 2. Assemble the crumble topping. Add all the dry ingredients to a medium bowl and using your fingers mix in the butter until well incorporated and the crumble is formed. Set aside. 3. In a large bowl beat the eggs, sugar, oil, and yogurt together until well combined. Stir in the zucchini and the carrots. 4. Mix together the flour, baking powder, baking soda, salt, and cinnamon in a medium bowl. 5. Add the dry ingredients to the wet ingredients and mix until well incorporated, but do not over mix. 6. Divide the batter equally between the two greased loaf pans. 7. Divide and sprinkle the crumble topping over the batter. Gently press in the crumble slightly with your fingers. 8. Bake in the prepared oven to 45 to 55 minutes or until a toothpick inserted in the center comes out clean. 9. Remove pans and set on cooling rack. Cool for about 10 to 15 minutes and then run a knife around the edge of each pan and remove loaves. Set back on the cooling rack and cool completely. 10. These loaves will freeze nicely. Love this mix of zucchini and carrot cake! And the crumble on top is a genius idea. Who doesn’t love a good crumble?! I’m a quick bread lover. Although my kids are grown they’re still not the greatest eaters and I’m wondering if this might be a great way to get both zucchini and carrots into them. And I love that this bread has yogurt too. That looks really good and hearty! Yes Dawn, zucchini and carrot sound good together, and like you I would not even think about it in the past…looks delicious and I like the topping as well. I don’t believe I’ve ever had zucchini and carrots in a bread before. But they sound like such a terrific combo! Really great idea — thanks so much.